As a brand new spin-out company from STFC’s Rutherford Appleton Laboratory in the U.K., Cella Energy’s new product development replaces high pressure cylinders with a conventional shaped fuel tank. In many ways hydrogen is an ideal clean fuel. One of the major barriers to its widespread adoption, though, has been safe, low-cost storage. Current hydrogen vehicle prototypes use high-pressure cylinders or expensive super-cooled liquids; neither are ideal for mass production. Cella Energy can now make materials that can store hydrogen in the form of micron-sized beads. This makes it possible to move the beads like a fluid, opening up a a major opportunity: It will no longer be necessary to try and re-hydrogenate the material within the vehicle. Difficulty in handling and storing is solved by using nanotechnology. 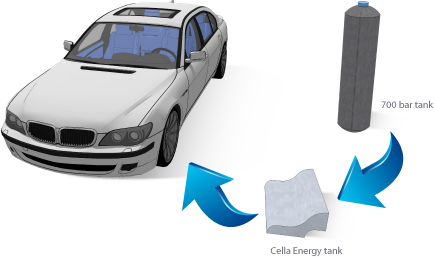 Cella Energy uses a low-cost process called coaxial electrospinning or electrospraying that can literally trap a complex chemical hydride inside a nano-porous polymer. That speeds up the kinetics of hydrogen release, referred to as desorption, thus reducing the temperature at which the desorption or release occurs, and filters out many if not all of the damaging chemicals. The nano-porous polymer also protects the hydrides from oxygen and water, making it possible to handle it in air. The coaxial electrospinning process is simple and industrially scalable; meaning it can be used to create micron-scale micro-fibers or micro-beads of nano-porous polymers filled with the chemical hydride. Complex chemical hydrides are not new. Some store hydrogen in concentrations that are well above 10 wt%. For example, ammonia-borane is 19.6 wt% hydrogen, 12 wt% of which is released at temperatures below 150°C. However, these materials have slow desorption (release) kinetics and can release other chemicals such as ammonia or borazine which could poison a fuel cell. For Cella Energy's new material, the accessible hydrogen content is reduced to 6wt%, but the temperature of operation is reduced so that it starts releasing hydrogen below 80°C and the kinetics of release are an order of magnitude faster. The company readily admits, though, the product thus far is ideal for proof-of-concept work and potentially useful for the initial demonstrator projects. However, it is not currently a viable commercial material, at least not yet. It is expensive to make and cannot be easily re-hydrided or chemically recycled. The fluid-like beads make it more easily packaged within an existing vehicle chassis design. Refueling can take place from a regular fuel pump and will not require high pressure or very-low temperatures. That makes it fit easily within the existing refueling infrastructure. For the record, there are two ways to use hydrogen for fuel: The first is a pure hydrogen solution with zero carbon emissions which can be burned directly in an internal combustion engine (ICE) or used in a fuel cell to generate electricity to run an electric vehicle (FC-EV). The second is as a fuel additive to reduce the carbon emissions from a hydrocarbon fuel such as gasoline, diesel, JP-8, jet-fuel or kerosene. By comparison to gasoline and natural gas, hydrogen is indeed the perfect fuel, having three times more energy than petrol per unit of weight; and, when it burns, produces nothing but water. Furthermore, hydrogen is the most abundant element in the universe, but does not occur naturally on our planet. Until now, storing hydrogen on a large scale has required either high pressure storage cylinders at up to 700 times atmospheric pressure (700bar or 10,000psi) or super-cooled liquids at -253°C (-423°F). 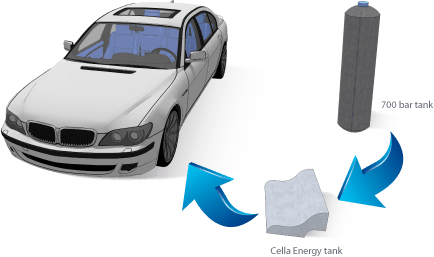 The Cella Energy technology achievement thus far means a hydrogen infrastructure for a billion road vehicles is now more feasible for the world. They will present at the FC&E in Washington later this year.